Wreath Ivy Topiary. Exposure: Bright, indirect light, Indoor Temp: 40 - 80 degrees F, Weight: 4 lb, Height: 13 inches. Live topiary plants tend to attract a lot of attention, and that goes double for wreaths like this beautiful ivy. There are several reasons for this. First of all, they are unusual. Some people hand Christmas wreaths, but those are generally not topiary, and even that is becoming less common. So a live topiary plant that is a wreath will catch a person's eye. This is especially true because wreaths tend to be decorated more heavily than ordinary fresh topiary plants. That is not to say that fresh topiary is boring, but wreaths have a special flair all their own. The decorations can be seasonal and topical, so that they never get old and you can have the fun of choosing new ways to decorate the ivy whenever you want. Ivy makes a fantastic backdrop to ribbons and color, because its leaves are a bright green with interesting variation and have a curved arrowhead shape. That accentuates any color of decoration you choose. Wreaths are one of the most interesting kinds of live topiary plants because there are so many ways to customize them. They allow for much flexibility in terms of the way that one can adjust them of configure them, which makes them perfect for those who are more on the creative side. 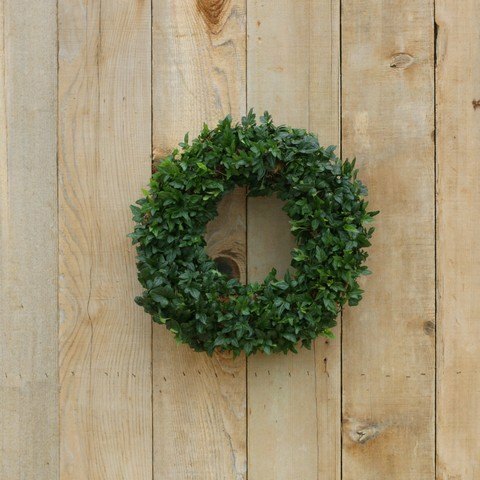 In addition, it is known that wreaths are often decorated: A fresh topiary wreath like this ivy is easy to form into a good shape, and then you can add decorations of your own to give it some personal touch and make it your own. In particular, if it is near Christmas or Easter, you can easily decorate them to complement the seasonal festivities. If not, then you can still decorate them as you like to suit your fancy! Live topiary plants already make good conversation starters, and wreaths are just that much more eye catching because of how easy it is to add ribbons and other colorful accents. The versatility of these flowers are also a wonderful aspect. Feel free to change them with the seasons- this ivy will look great no matter what colors you use, because its leaves catch the light and brighten color. The green goes well with many different color profiles in different seasons, so don't be afraid to mix it up for different times of the year. Fresh topiary is already a novel way to garden, and wreaths just take that to the next level. Wreaths of ivy also make great gifts for someone you know who has a fondness for a certain color. You can design the plant with an emphasis on that color, and it will be a pleasing display for a long time.